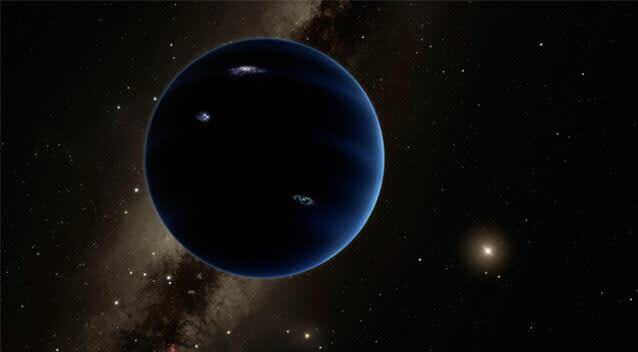 The mysterious planet is said to be 10 times larger than Earth and 20 times further away from the sun than Neptune. "There are now five different lines of observational evidence pointing to the existence of Planet Nine," Konstantin Batygin, a planetary astrophysicist at Caltech, California, said. One of the main indicators to its existence, is a gravitational pull that appears to be disrupting the distant Kuiper Belt beyond Neptune. Six objects within the Kuiper Belt all have elliptical orbits pointing in the same direction, providing further evidence to Planet Nine's existence. But to provide further evidence, these orbits also are tilted the same way, about 30 degrees "downward" compared to the pancake-like plane within which the planets orbit the sun. In turn, this would now suggest a previously unexplained six degree tilt of planets to the sun's equator is down to Planet Nine. The final giveaway of Planet Nine's presence involves the solar system's contrarians: objects from the Kuiper Belt that orbit in the opposite direction from everything else within the solar system. NASA has also moved to quash conspiracy theories that Planet Nine or any other planet currently has potential to collide with Earth. A hidden world named Nibiru has garnered significant attention for its supposed potential to crash into Earth but NASA has now categorically denied its existence. Doomsdayers had revised the date for the world's end to October 15, but an end to human life failed to come to fruition. The only danger Planet Nine poses is a self-imploding occurrence, but such an incident, if it were to occur, is over seven billion years away, The Sun reported. “The existence of a distant massive planet could fundamentally change the fate of the solar system," said Dr Dimitri Veras of the Department of Physics.